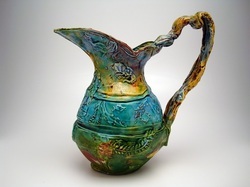 For 30 years Lisa Orr has been a professional potter and student of ceramics. She completed an MFA at the NYSCC at Alfred University in 1992 and later received grants including a Fulbright and a National Endowment for the Arts Mid-America Arts Alliance Fellowship Her work is in numerous public and private collections including the Fine Arts Museum of San Francisco, and the permanent collection of WOCEF and the Yeoju World Ceramic Livingware Gallery in Korea. Currently she teaches, lectures and shows nationally and internationally. Lisa’s artworks for the table often refer to traditional porcelain or diner whitewares, but with softer forms inspired by the playful and abundant qualities of Mexican earthenware. She invented her own production process after studying clay mold fragments in antiquated factories and museums. After forming pieces in molds, on the wheel, or both, she finishes with stamps, slips, sprigs and multihued glazes. Though Lisa’s colors can evoke a happy garden, it is the strength of her form that sets her work apart: it feels muscular and strong while showing fluidity. In this way she plays both ends of the spectrum, from the dynamic and substantive to the detailed and dreamy--full of surprise. Her artwork is best presented with a lovely meal.